Fit-Ink: Whoa, What's Going on with Crunch? Crunch is bankrupt, that's what. Unless you're a member of this gym, the news could easily have flown under your radar. I totally missed it--even the clues for gym closings around the country--until last weekend when checking the news on my gym's website. And even there I almost didn't see the announcement that Fitness Formula Clubs had stepped up to offer memberships to those who'd be without a workout center when Chicago's Crunch location at Grand and Wabash shutters on September 30 (good news is that the North and Sheffield location is still open, supposedly). Plus I didn't make the connection when an old friend posted that she was enjoying one last workout at Crunch before it closed--I just assumed that the Atlanta locations were consolidating. But apparently it's been in the news since May when Crain's New York Business reported the chain was "crunched by recession." 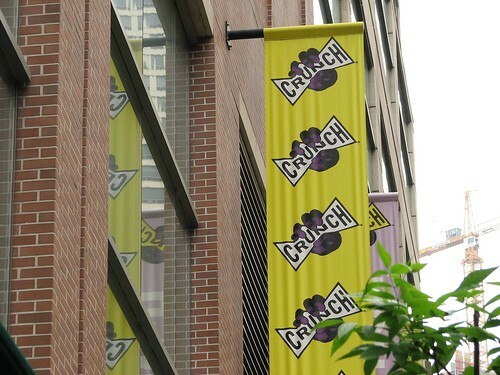 Crain's first reported that Crunch would only be closing one of its 25 locations, that being in the middle of Manhattan. That was May. Now Atlanta locations shuttered shop by August and have disappeared from the website under gym locations. In Chicago, Fitness Formula Clubs have acquired the memberships of those belonging to the Grand and Wabash Crunch location so those members won't lose out on service--check out their agreement here. Yet the confusing part is that Crunch's website still lists that location and makes no mention that the club is closing in only a few days. And if you search other cities with Crunch presence--Miami Beach, San Francisco, East Bay, Los Angeles, Brooklyn and New York City--with the exception of the Big Apple, you'll notice only one or two locations in those cities as opposed to mass quantities. Chicago for example used to have five or six spots with the first three quietly closing in 2007 or 2008--Orleans, Marina City and Diversey.